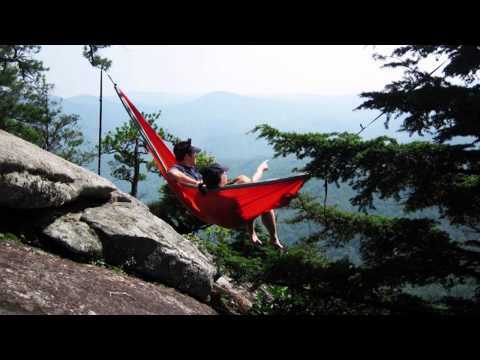 The Eagles Nest Outfitters Singlenest Hammock is light enough to make the backpacker's cut, but robust enough for backyard luxury, the SingleNest is the go-to for any occasion. Granddaughter is very happy with this hammock. She attached it to trees on our property when visiting at Christmas. Bought two of these, one for each of my toddlers. They LOVE them. My four year old said it was his favorite present for Christmas, that's compared to a fully loaded outside playset. Our family has two of these hammocks and we love them (will probably need to buy more). The fabric is lightweight yet durable, it's easy to put up, packs up small for travel. This does not come with suspension straps. I bought (2) ENO's for my teenage daughters and they loved them. They get together with their friends who also own ENOs and the have ENO parties. The quality is excellent and the are easy to transport anywhere. I may by two more for my wife and myself! My Granddaughter is delighted with the ENO Hammock. The product is exactly what she wanted and the quality of the item is excellent. You also provided me with the BEST customer service (including delivery) that I received from any other establishment during the Christmas season. Thank you! Santa brought two ENO hammocks to our boys this past Christmas, and they were a hit! They've already camped out in the basement and can't wait to use them outdoors in warmer weather and on camping trips. So easy to hang with the slap straps (sold separately). Bought for my kids. It is very well constructed. My husband and I bought single hammocks for each of our five children and it makes it so much easier to do quick camping trips because we can all sleep in our hammocks and we don't have to set up tents! The ENO Single Nest is every thing it is advertised to be. Easy to set up and use, takes up very little space in your pack and is very lite weight. ACK did a great job in quick shipment and delivery of my hammock. Everything it is advertised to be. Easy to hang and easy to sleep in. Lite weight and takes up very little space in your pack. ACK did a great job of quick shipment. The must have gift for the graduate! My daughter loves her Eno and requested that we give them as graduation gifts! I have never received such enthusiastic responses for a graduation gift, actually any gift! The Enos were hanging in trees the minute the gift was opened. ACK provided excellent service and a quick delivery! Bought this for my niece for Christmas. It was out of stock when I placed the order. I called ACK and they assured me the item would be in in the time I needed it. They were right! I can't rate as to how the item has functioned, but I can review on the service I received. A+!!! This item was a gift so I am unable to give a review from personal experience with the product. I can, however, say that the recipient had been requesting this item for over a year and has been beyond thrilled with it. I would also like to make a note of appreciation to ACK for helping me out so extensively when FedEx misplaced my original order. I hear people say customer service is a thing of the past but that was not the case here. They went above and beyond to help me out! This is the third Eno hammock we've purchased and we love them...well- constructed and portable. We use them on our camping trips and our daughter has really enjoyed being able to use her Eno hammock around her college campus. Great product! My sister loved it and is looking forward to using her hammock! The ENO Singlenest is a great little hammock with lots of versatility! Very light-weight, comfortable, and deceivingly strong! The price isn't bad either! I think it's a great hammock to get started, then when your utility outgrows it, you can go for something fancier, but I doubt you ever will! Purchased product for my grandsons and they were very happy. A very good experience. The hammock was a real success. Do you carry the straps and/or hooks with which to install it or otherwise hang it up? If so, how much do they run - with shipping. The Singlenest is awesome, but I recommend getting the Doublenest for just a little bit more. I wish I had purchased the Doublenest for the extra room/comfort. Nice hammock. I have set it up a couple of times and tried it out but havent been backpacking with it yet. Light and comfortable and also easy to setup. I might give it another star if some way to connect it to a tree were included. Super comfortable and extremely easy to use. Overall great! Most comfortable hammock Ive had the pleasure to sleep on. Worth the money. I use mine mostly for camping at Oak Mountain State Park. Would recommend buying the extra tree straps, using paracord holds good but streches. Ordered this hammock after a buddy of mine bought one and raved about how great it was. We immediately took it out for an extended weekend through Pisgah National Forest. With a man-made bug netting, we both had very peaceful nights rest! Very durable. I am 64 tall and weigh 185 pounds and it held me no problem. I know many people who are bigger tend to get the doublenest, but you can not go wrong with this one either! Great product and great price! Comfortable, really easy to hang, sturdy and compact. We won't leave home without them, we just took them on a week kayaking trip. The straps are a must and ACK service is the best! It is extremely comfortable and lightweight. It fits easily in a backpack and is super easy to set up. Perfect for camping or just napping in the backyard! I am a 320lbs big guy. I want to do all the things the little people do. Kayak, hike, rock climb, and when the day is over, hang out. Getting to use this little hammock is a blast! It is durable, well made and should last a long time if treated well. I have never felt like it was going to give at all. love it. so convienent and portal. just as describe, about the size of a softball, plus bag is attached to the side so I dont have to worry about losing the bag. very relaxing. overall love it. Q: does the hammock come with straps or do i have to buy that separately?